Stylists are most satisfied when a client leaves the salon with the perfect look. 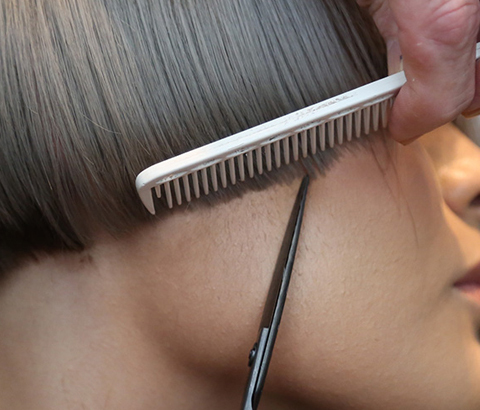 In order to achieve that, a great cut is crucial for bringing style and color to life. Wella Professionals cutting methodology focuses on the cause and effect with the 2 dynamics of a haircut - Technique and Shape. Elevate your craft by discovering how to create infinite possibilities for your clientele and showcase your artistry! • Create with purpose – back up your instincts with professional methods to discover suitability based on your clients’ personal style. • Understand how to determine the best technique and shape to bring your creation to life. • Frame the face and your work with the perfect fringe. © 2019 COTY Inc. - All Rights Reserved. 1. All rights, including but not limited to intellectual property rights and copyrights, in any and all of the seminars / trainings / materials available through this site are owned or controlled by COTY unless expressly stated otherwise. 2. The seminars / trainings / materials available on this site are for non-commercial use by employees and/or our customers (including the customers’ employees) by invitation only. Except where expressly stated, no person shall, without the prior written approval of COTY, copy, transmit, share with a third person, adapt, or change for any purpose whatsoever any of the contents of the seminars / trainings / materials available through this site. 3. The contents of the seminars / training / materials available on this site are for informational purposes only and are intended, but not guaranteed to be correct, complete, or up to date. COTY accepts and undertakes no liability for the interpretation and / or use of the information contained in any of the seminars / trainings / materials contained on this site, nor does it offer any warranty with respect to the contents herein, of any kind, whether express or implied. 4. Nothing contained in this site shall be construed to place COTY and any of its customers (including the customers’ employees) in a relationship as partners, joint venturers, employer and employee, or principal and agent.